This year we are celebrating our 50th Anniversary! In celebration, Public Relations alumnus Dawne Widener-Burrows, B.S. Public Relations 1976, has issued a $50,000 match gift in honor of our college-wide anniversary. Our goal is to raise $50,000 by Oct. 31 to provide critical resources that will help advance all of our areas of study — and the student experience here at the CJC. For more on 50 for 50, click here. Make a gift to the fund of your choice today. With your help, we can prepare our students to tackle the communication challenges of the next 50 years. As we celebrate the University of Florida College of Journalism and Communications’ (UFCJC) 50th anniversary this year, Dean Diane McFarlin asks alumni to consider a planned gift that will strengthen the College’s future and influence generations of storytellers to come. 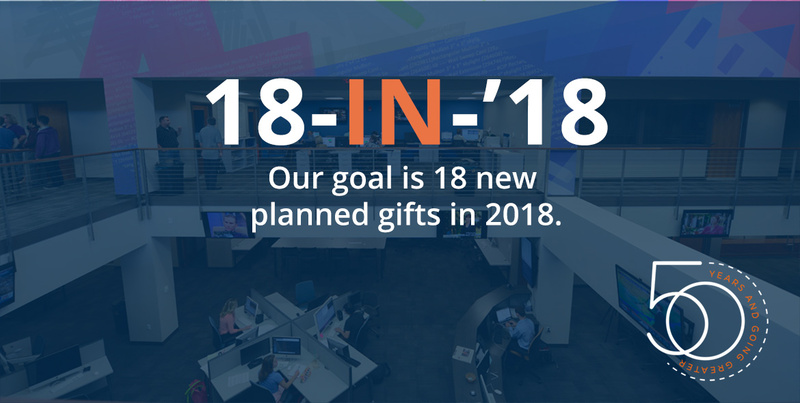 Our goal is 18 new planned gifts in 2018. For more information, click here. What are the right giving options for you? Gifts can include cash, credit card payments, stocks, life insurance, real estate, or other assets that are part of an estate. Benefits to you can include income tax savings via charitable deductions; bypassing capital-gains taxes on contributions of appreciated properties; possible reductions or elimination of estate taxes; an enhanced income for you and/or your loved ones through life income gifts; and the creation of your legacy. Your last will and testament represents your life’s work and your dream of making a difference past your lifetime. Please consider The College of Journalism and Communications in your legacy through a planned gift!